His Grace Thomas Mar Makarios, first Metropolitan for the American Diocese and founder of the Mission Society of St. Gregorios of India, died two years ago today, February 23, 2008, in England after consecrating a church there. The tomb above was completed last year. Read and/or listen to Fr John Brian's tribute at the Bishop's 40 day memorial in Chicago (Bellwood). May his memory be eternal and may the Lord carry him in the bosom of Abraham, Isaac and Jacob, where all the righteous dwell. Holy Transfiguration Mission chapel in Madison, Wisconsin will have a memorial Qurbana on Sunday, February 28, 2010. Bishop Makarios (of eternal memory!) is laid to rest in our church headquarters which is located in India in the southwestern state of Kerala in the district of Kottayam in a room next to Devalokam chapel. 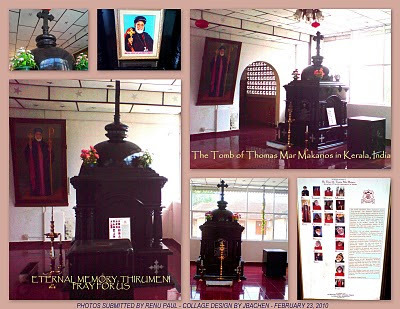 The relics of St. Thomas, one of Christ's original disciples, and the remains of other hierarchs of the Indian Orthodox Church are also interred in Devalokam.